Yesterday I brought the kids to our local community health clinic for their vaccinations. Bronte was due for her 18 month boosters, so I booked Linnaeus in to get his pre-kindergarten shots at the same time. Of course we biked down there--it's the fastest way to get the two or so kilometres to the clinic. The one thing I don't like about biking to the clinic with our Yuba Mundo is the bike parking situation. It's a tiny parking lot & the bike racks--several single loops in a row--are crammed in where there's space, between the ends of the car parking spaces & a railing. 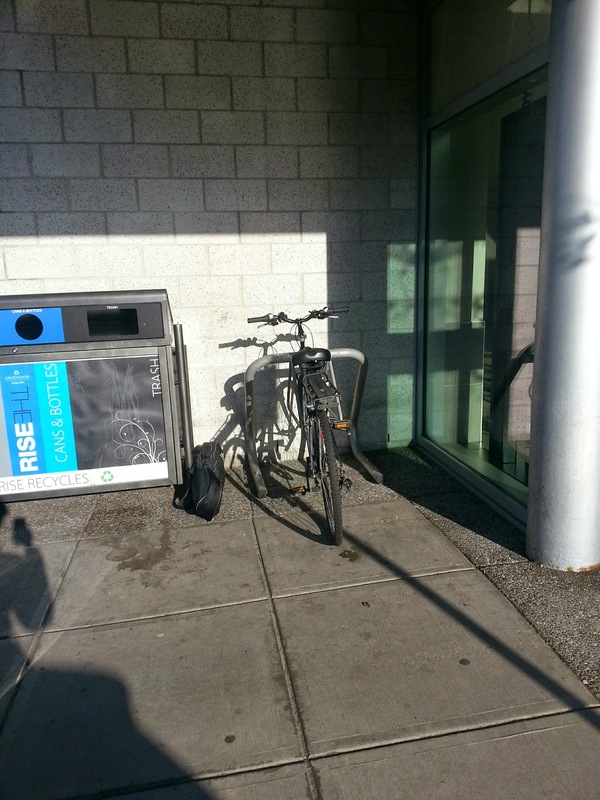 There was a bike at each loop, & only spaces on the side between the racks & the railing. The Yuba, with its running boards on the back & basket on the front, doesn't fit in such tight spaces. So I had to wiggle up against the railing beside a loading spot instead, hoping the aren't picky about where bikes get locked up at the clinic. This is a common problem, actually, that businesses squeeze their bike racks into out-of-the-way corners, or tiny spaces with 30cm or less on either side of the rack like you see to the right. Bike parking is nearly always retrofitted after the car parking is planned, but even when it's a new building, the bike infrastructure seems to be an afterthought. I would love to see a little more thought go into the placement of racks. A simple option for businesses that have a parking lot would be to take one car parking space & put the bike rack in the middle of it. Rather than just providing room for one driver, this would mean that as many as ten customers could park their bikes in that one space. A lot more efficient, no? Even for businesses that don't have their own lot, just leaving a little more space around the rack would go a long way to make cycling to that business easier, especially for the growing number of us who ride cargo bikes. With two little kids on my bike, I need to have space around it to load up my purchases & get the kids into their seats. Racks like the one in the picture seem to be designed for single people on regular bikes who aren't actually going to be loading anything into their bike. But this is Home Depot, a place that sells a lot of big bulky stuff. Seems silly to make it hard for customers to take such things home from your store, right? This is an issue that I plan to bring up in my new position on the Active Transportation Policy Committee for the City of Vancouver. 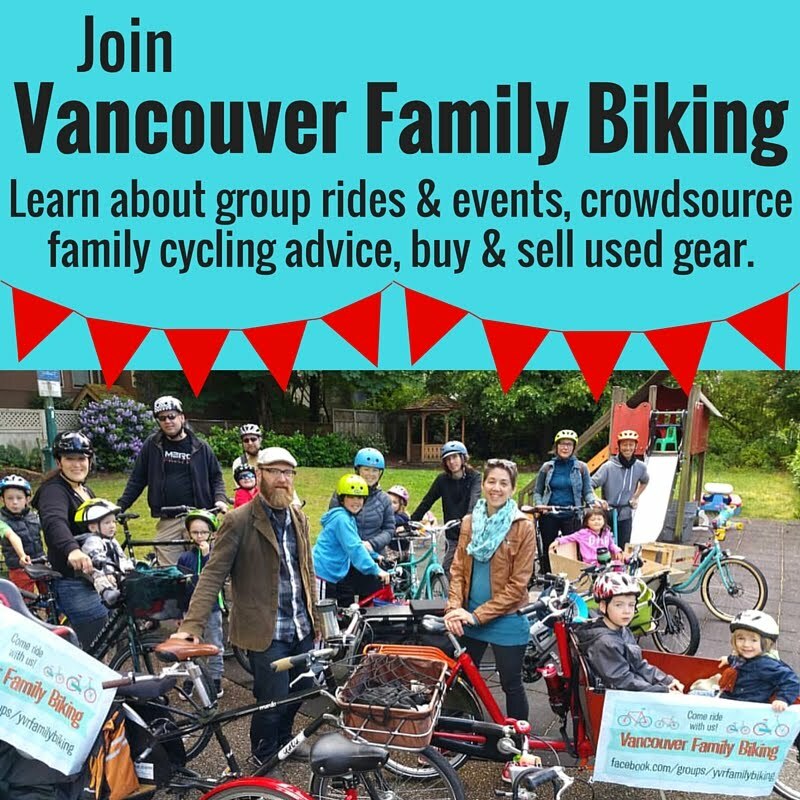 Got any feedback you'd like me to add around bike parking in Vancouver? How do you think we could improve it? Stratas also fail to plan well for bike parking, if the buildings I've seen are any guide. Frequently an afterthought chain-link cage in the parking garage, and usually woefully poor capacity for how much use they get. It's also typically a free-for-all so whoever is rudest about parking their (frequently unused for months, if ever) bikes wins the spots. It's a hidden mess that further discourages bike commuting. & you're right--nothing discourages bike commuting more than your building saying you can't have the bike on your balcony or in your suite, but there's no other secure place to park it. Bike parking for housing is a whole other blog post, definitely. I'll be sure to bring that up at the next ATPC meeting. I'm not actually sure if there are policies around required number of bike parking spaces/racks/rooms in multifamily buildings the way there are for car parking spaces. Thanks for the comment, TQuid! I appreciate you pushing the city to raise awareness of this ... I am not sure that creating rules around bike parking requirements is the way to go, but then again, what do I really know? In the meantime, what I do is to go into stores that don't have adequate bike parking, approach the manager, and calmly explain that I would love to spend my money at their store, but as they lack the bike parking that I need, I will take my business elsewhere. I then remind them that for every person like me who comes over to let them know there are plenty who won't bother to say anything, but just shop elsewhere. I don't know if there's much policy can do either. As far as I know right now, the city will install a rack if there's sufficient space on the sidewalk, & businesses just have to request this. I don't know how many businesses know this, or realize how many people bike to them. I saw some stats recently that said when business owners are polled, they grossly OVERestimate the number of drivers & UNDERestimate the people who bike to their business. Parking a cargo bike can be a real challenge, for all the reasons you mentioned. BC cancer Agency recently reconfigured one of their bike parking areas and, while it's the same size as a car parking spot, it's wedged *between* two car parking stalls. To make matters worse, the "entrance" to the bike parking is blocked by a giant cement pillar, so the only way in or out is *through* one of vehicle stalls. Tough lucks if those spots have vehicles in them when you arrive or want to leave. Two of the other bike racks are on raised platforms that I couldn't possibly lift my cargo bike onto but, even if I could, they're not wide enough to accommodate my bike on the end/outside of the rack. It's very evident (and frustrating) when bike parking is an afterthought.